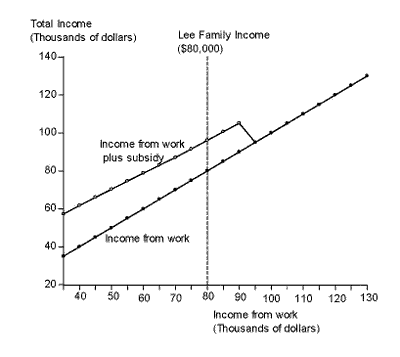 The graph shows income from work and the corresponding health care subsidy for a family of 4 headed by a 55-year old. The subsidy is paid to households earning up to 400 percent of the poverty line. With a poverty line of about $23,300 for a family of 4 in 2014 (when the legislation goes into effect) families earning as much as $93,200 will get a subsidy. Observe how the subsidy declines with income and then is slashed to zero when 400 percent of the poverty line is hit. You can even see the V-shaped “notch” in the graph, which has become the technical term used to describe such sudden drops in subsidies. Consider the Lee family, for example. They earn $80,000 and thus get a subsidy of $16,100, bringing their total income to $96,100. But suppose they decide to work more. If they increase their income from work by $14,000, bringing their work earnings to $94,000, then their health care subsidy drops to zero. So they get less income by working more, and that’s a big disincentive. Who Is At Fault For A Routine Checkup? You and Kessler are right on! Can you imagine the outrage that would occur if congress were to impose a marginal tax rate equivalent to the “notch” on the middle income taxpayers affected by this threshold? Yet this is exactly what we have in the health care reform. Keep up the economics education effort. Our nation badly needs it.